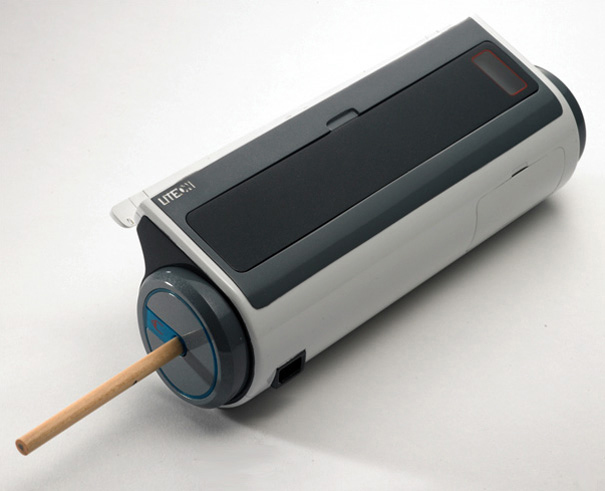 If you often find yourself searching for a pencil, then this clever little device called the P&P Office Waste Processor will keep well stocked by quickly producing them from simple office waste paper. 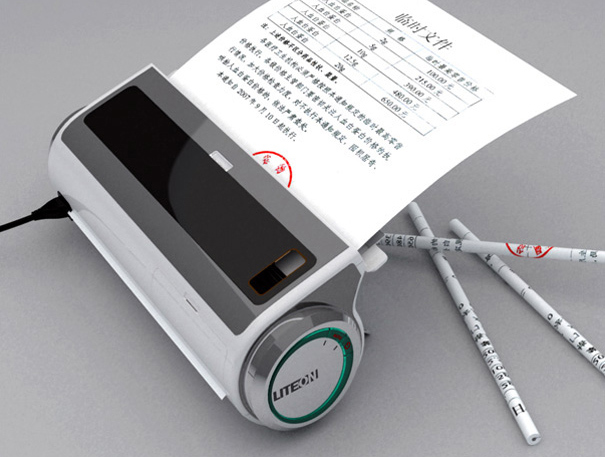 The device gobbles up your paper waste basket contents and spits fully formed pencils out at the press of a button. Learn more after the jump! The designers make the clever connection between an office’s waste stream and supply needs with a satisfying design that produces something truly useful — if not perfunctorily named. The literature says you simply feed a sheet of paper into the top and the device will wrap it tightly around a graphite stick, adding a bit of glue to keep the paper together. Once ready, the freshly minted pencil pops out the side. There are plenty of paper-based pencils on the market, so it seems the product is viable, but since the user needs to supply glue and graphite sticks there is some fiddling. A transparent cover allows you to see the operation which can be set for automated or manual (although they do not explain what that exactly means). The P&P will even pre-sharpen the pencil before spitting it out. The same hole is also an automatic pencil sharpener. The award winning device by Chinese designers Chengzhu Ruan, Yuanyuan Liu, Xinwei Yuan and Chao Chen looks promising, but as of yet, it’s not in production. If this high tech device really does what it claims, it could be quite popular in schools or some offices where folks still use the low tech pencil. Only time will tell if the design makes it to the local office supply store, but we are crossing our fingers. Where is it available for sale? Good and Brilliant thinking for this innovator, where can i buy this machine and the grapit lits i have hug hib of papers around. Awesome! I need one of these. Things like this scare me. It scares me because it seems to catch on as something "hip" or "appropriately trendy", and something that we all feel is environmentally good. But is it? Paper (which I do believe we should find ways to recycle sustainably) is a regenerating material, plastic is not. How much energy and waste goes into making a small machine that recycles an already regenerating material? How many of these machines will eventually become waste, most likely within 10 years? I don't mean to be cynical, but I do believe, as a society, we should question everything and not be so quick to think something is right or wrong. I applaud the innovation, but I question if it is really a step forward in human advancement. Yes, where can we buy this one? Pls let me knw how n wer I may purchase ds machine. Thx for ur sharing! How can I get one of these machines? My company has tons of paper to recycle every year. So where can one get one of these and the supply of carbon sticks for the centers? Where can i get this machine & at what Price? I would like to have one, can you please advise from where i can get this awesome piece. I want one to please let us know how to get this awesome idea!!!!!! I want one! I could recycle my paper, make pencils to sell for my charity (Stairway to Heaven Memorial Trust)...win win! !